The new Nokian Hakkapeliitta LT3 winter tire offers exceptional winter grip and driving stability combined with strong structure and superb durability. Designed for demanding winter use, the new Nokian Hakkapeliitta LT3 is reliable and safe on icy roads and snow-covered worksites alike. To maximize the durability of this special winter tire, Nokian Tyres is introducing the world’s first stainless steel stud innovation tailored for heavy-duty use. The new Nokian Hakkapeliitta LT3 completes the modernized Nokian Hakkapeliitta winter tire family. The versatile Nokian Hakkapeliitta family includes novelties for passenger cars, SUVs and vans alike. The new Nokian Hakkapeliitta LT3 is specially developed for demanding winter use offering state-of-the-art safety, driving stability and durability for professional use as well as daily driving. In addition to the excellent winter properties, strong construction and great mileage, the Nokian Hakkapeliitta LT3 stands out from its predecessors thanks to the unique stud innovations and increased tread depth. Nokian Tyres, which developed the first winter tire and holds over hundred winter safety patents, completely redesigned the studs on the Nokian Hakkapeliitta LT3 to tailor it for heavy use and harsh winter conditions. The comprehensive and modern size selection of the Nokian Hakkapeliitta LT3 covers 16 products from 16 to 20 inches with a speed rating Q (160km/h) and it will become available to consumers during autumn 2019. The key markets for the Nokian Hakkapeliitta LT 3 are the Nordic countries, North America, Central Europe and Russia. The tire will be available with both factory studding and as a non-studded variant. The non-studded Nokian Hakkapeliitta LT3 is developed and tested to offer maximal winter safety in areas, where studs are not permitted. At the most demanding driving circumstances tires are the first line of defense. The greatest challenges in wintry weather and hazardous road conditions are braking performance, lack of grip while cornering and changing lanes on snow-packed roads. For heavy vehicles, traction is especially crucial. Nokian Tyres’ renowned Hakkapeliitta winter tires are designed to tackle even the most extreme winter conditions safely and reliably. Driving on snowy and icy roads with heavy loads can be stressful especially with tires not designed to handle the task. 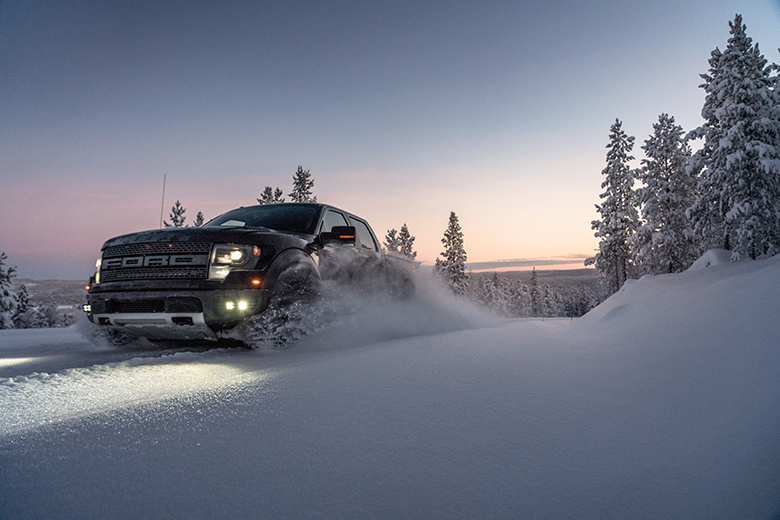 Nokian Hakkapeliitta LT3 is made for heavy 4X4’s and pickup type light trucks and is the perfect companion for plowing roads or towing a trailer during the cold winter months. The most important feature of the new Nokian Hakkapeliitta LT3 is the renewed stud technology. The Nokian Tyres’ new Arctic stud concept consists of completely new stud model and body material, improving durability in heavy use and tough winter conditions. The studs are made of stainless steel, which adds both style and functionality. The stainless steel studs are corrosion resistant, so the tire is able to withstand salted road conditions longer. While optimizing the top of line winter grip and handling properties, it also keeps the appearance stylish. - With a new, functional design, the new stud concept offers extreme grip on slippery conditions and more safe kilometers. The anchor stud has a new bottom flange shape and a star-shaped hard metal pin. The stud body is made of stainless steel, which improves durability in demanding use as the stud will not rust. In addition to the new material, the new studs are oriented into the stud hole using the new bottom flange. The new studs are 12.7 millimeters in length making them 2 millimeters longer compared to the previous model. It will take longer for the studs to wear out, explains Tommi Ajoviita, Development Manager from Nokian Tyres. The new Nokian Hakkapeliitta LT3 comes with increased tread depth of 13.5 millimeters and the models with a higher load index ( >121) with a tread depth of 14.5 mm. Thanks to added tread and increased stud retention the tire offers more durability and better mileage. The tire also features a new, aggressive tread pattern to effectively remove snow and slush between the tire and the road. The design of the tread center improves stability and steering response, while the tailored siping offers excellent traction and cornering grip. The new arrow-shaped pattern features deeper grooves for added slushplaning resistance and self-cleaning capability when driving in deep snow. Arctic stud concept: No corrosion, more safe kilometers. The new stud concept improves grip and durability in heavy use and though winter conditions. The stainless steel studs add both style and functionality. The stainless steel studs are corrosion resistant, so the tire is able to withstand salted road conditions while keeping the appearance stylish. Aggressive tread pattern with deep grooves. Effective removal of snow and slush. The design of the tread center improves stability and steering response, while the tailored siping offers excellent traction and cornering grip. Deeper grooves add slushplaning resistance and self-cleaning capability. Sipe activators for strong snow and ice grip. Sipe activators located on the tread shoulders ensure driving safety under rapidly changing weather conditions. Wider sipe activates the narrower sipe. This functionality adds grip for extreme situations in the most slippery road. Brake Boosters for better braking grip. The brake boosters on the tread block shoulders improve braking grip on snow. The serrated pattern of the brake boosters improves especially snow grip. Arctic Grip Compound. Excellent mileage and cut resistance. The extremely tear and cut resistant tread compound is developed specifically for heavy-duty use. Aramid Sidewall technology. Extreme durability. The extremely strong aramid fibers strengthen the tire’s sidewalls providing more durability and protection for demanding driving situations. The fiber makes the tire more resistant to impacts and cuts that could otherwise easily damage it.